Handy Man Insulation Co. - Click or Call for a FREE QUOTE! We’ve got a new REFERRAL PROGRAM! Here's an interesting tidbit: From every job we get from someone calling after seeing or hearing our advertising, whether print ads or on the radio, we usually get three or four more jobs from them telling their friends, family, coworkers, fellow church members etc.! To further reinforce this dynamic, we now offer a fantastic referral program that rewards you and your referral with sweet discounts! We rely heavily on referrals to help us grow as a company, that's why we ALWAYS make sure each and every customer is 100% satisfied with the work we've done before we collect a single cent! Call 855-5-INSULATE today to find out more. 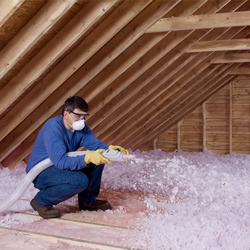 We now offer SPRAY FOAM INSULATION! We are always on top of our game. Keeping up with new technology and insulating methods is important to us. For that reason, we are very excited to now offer OPEN AND CLOSED CELL SPRAY POLYURETHANE FOAM INSULATION! You’ve seen it on TV shows like “Holmes On Homes” and other HGTV and DIY Network programs, and now it’s available to north east Ohio! Some consider spray foam insulation a luxury insulation because of its slightly higher initial cost, but there are HUGE benefits involved. It not only has a much higher R-value per inch than any other type of insulation on the planet, but it is also an air barrier and moisture barrier as well. The foam expands, filling gaps, cracks, voids and crevices which can otherwise lead to drafts and moisture/allergen infiltration. These attributes make it perfect for completely sealing the thermal envelope of your structure. Another great benefit of spray foam insulation is that it can also be installed in structures like steel buildings and pole barn style buildings which have nonstandard framing. Call or email for more details on how you can have spray foam installed in your home or business. The Handy Man Insulation Co. is a local family owned and operated insulation installer. You benefit by using us for all of your insulation needs because you deal directly with the owner, not some salesman who is just out to make his commission. We are equipped with the tools, knowledge, and wide array of name-brand products to insulate any structure, new or old, big or small. We do it right the first time, eliminating the need to come back and fix mistakes other insulators make while rushing through each job. So give us a call to schedule your next project, you'd be surprised at how low our rates are and as always, our quotes are always free! © 2019 Handy Man Insulation Co.